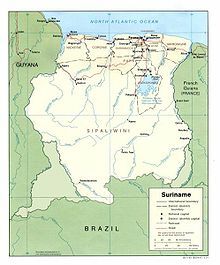 Suriname, or Surinam, Dutch Guiana, Dutch Guyana or Sranang is a country in South America. The official name of the country is Republiek Suriname (this is Dutch and translates to Republic of Suriname). It used to be known as Nederlands Guyana, Netherlands Guiana or Dutch Guiana. It is between Guyana and French Guiana. Paramaribo is the capital city, in which resides almost half of the country's population. About half a million people live in the country. Suriname became independent from the Netherlands in 1975. Before that, it was a part of the Kingdom of the Netherlands. 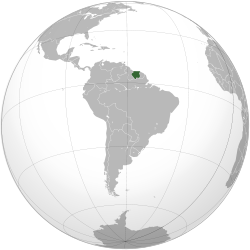 There are border disputes with French Guiana and Guyana all to the south of the country. The industry of the country is centered on the mining and processing of bauxite. This makes up 15 percent of the Gross Domestic Product and more than 70% of the exports. Other exports are sugar, oil and gold. About 25% of the working people are employed in agriculture. The main trade partners are the Netherlands, the United States and countries in the Caribbean. Dutch, French, Spanish and English explorers discovered the area in the early 16th century. A century later, sugar plantation colonies were established by the Dutch and English along the many rivers in the fertile Guyana plains. After the second Anglo-Dutch War England traded any claims to the territory for New Amsterdam which became New York. ↑ 2.0 2.1 2.2 2.3 "Suriname". International Monetary Fund. Retrieved 21 April 2010. This page was last changed on 8 August 2018, at 18:14.